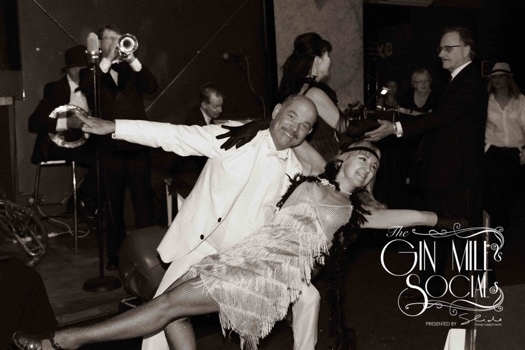 It’s as hot as one of Gatsby’s parties, it’s The Gin Mill Social! 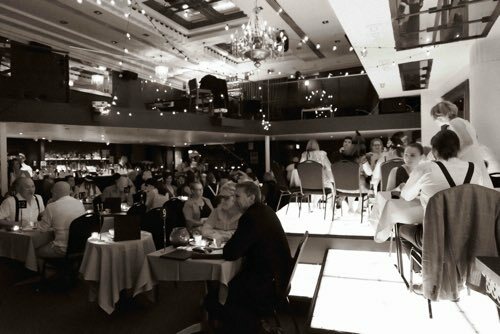 The fun never stops as live swing musicians play all night long and vaudeville performers pop up to entertain when you least expect it. The first of those swing bands is singer Greg Poppleton's real 1920s trio with Geoff Power on cornet doubling sousaphone and Paul Baker, banjo. Read, see, book the Band. Greg Poppleton waves from behind the vintage mic as a group of Gin Mill Socialites gather for a photo under Missy on the hoop. 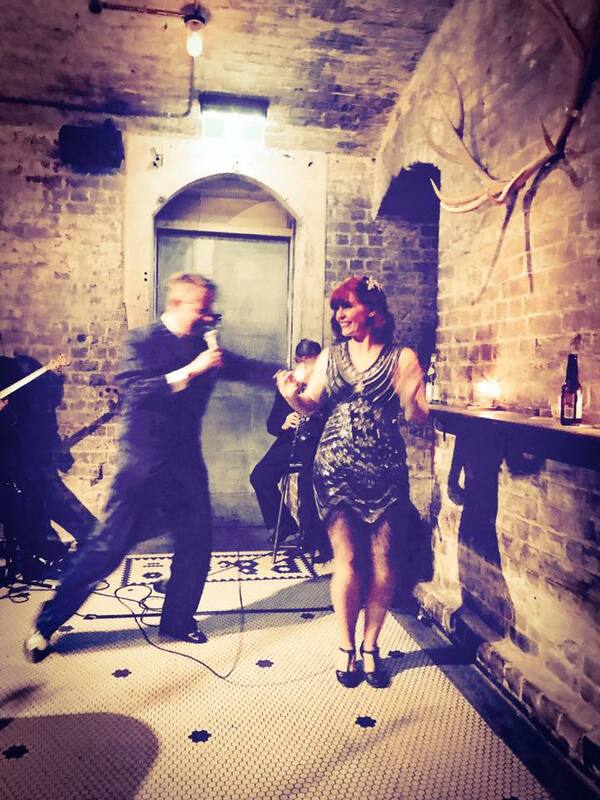 Classy couple dancing to Greg Poppleton's 1920s jazz. 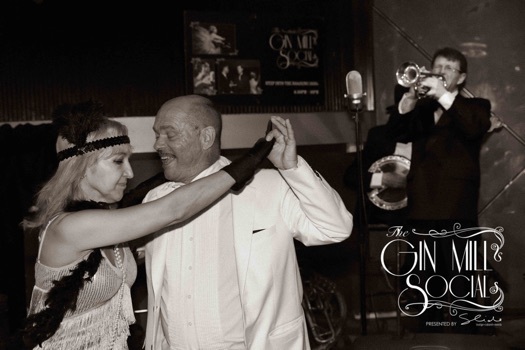 How Greg Poppleton's 1920s Trio looks from the Gin Mill Social mezzanine. Geoff Power cornet, the brass section of Greg Poppleton's 1920s Trio. 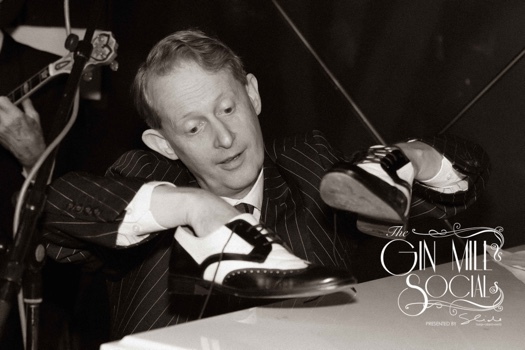 Greg Poppleton using his shoes as percussion on the piano as his 1920s Trio solos. It’s the 1920’s in here! 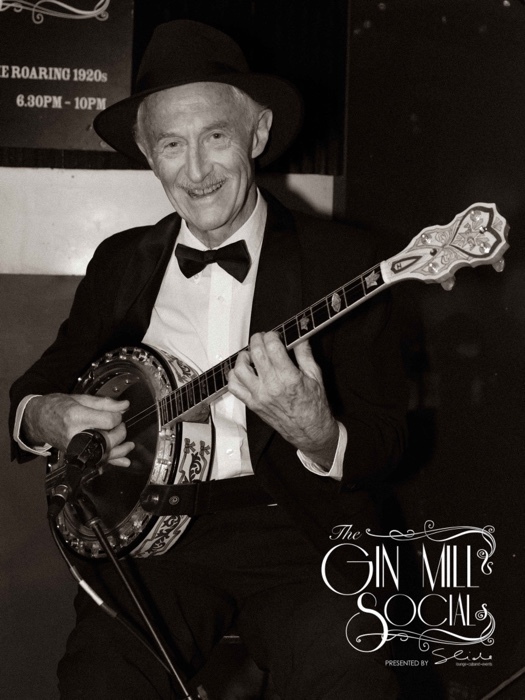 The Gin Mill Social is back at Slide Cabaret. 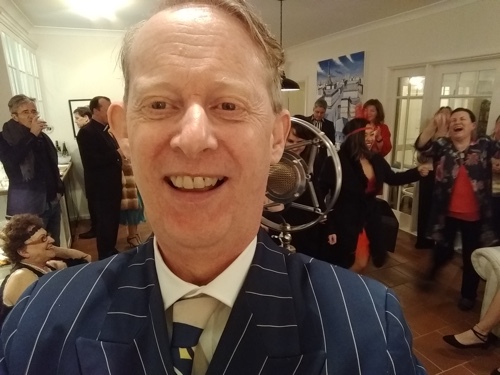 Greg Poppleton kicked off the relaunch of Sydney's favourite 1920s night last 13 December 2018. Inside an old closed down bank lies the hottest spot on the strip. 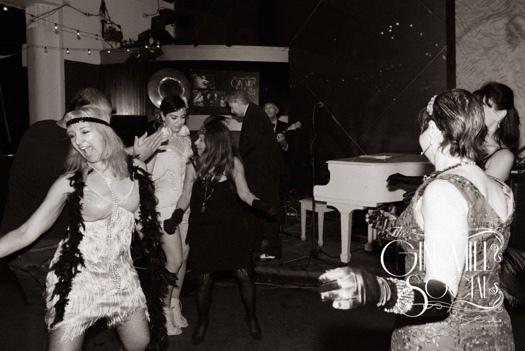 Its prohibition time, an era of secrecy and excess and you have the secret password…. Hang out the front of the old bank when you arrive, but look busy, we don’t want those cops spotting you. 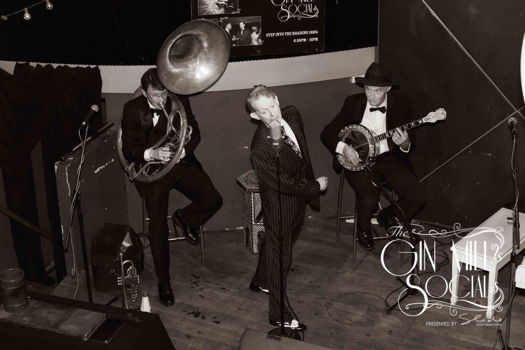 - The party begins at 6.45pm sharp with Australia's only authentic 1920s-1930s singer, Greg Poppleton with banjo, trumpet and sousaphone. - Food is served banquet style, arriving on platters made for sharing. Eat as much or as little as you like. - The dress code is simple - Girls in pearls. Guys in ties. The Gin Mill Social is perfect for corporates, a birthday, anniversary dinner, meet with the in-laws, hang with the outlaws, or simply to reconnect with old friends. Candles are lit. Lights are low. Conversations are loud. It’s a lively atmosphere. 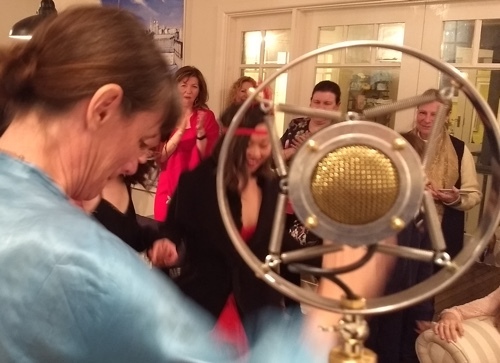 Join us….. Feast, dance and play! Book Greg Poppleton for you event. 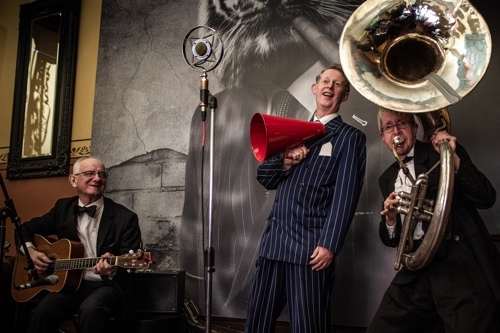 The Greg Poppleton jazz deco 1920s trio were hired to entertain with real Great Gatsby music for a 1920s-themed professional gathering at Sydney's Arthouse Hotel. 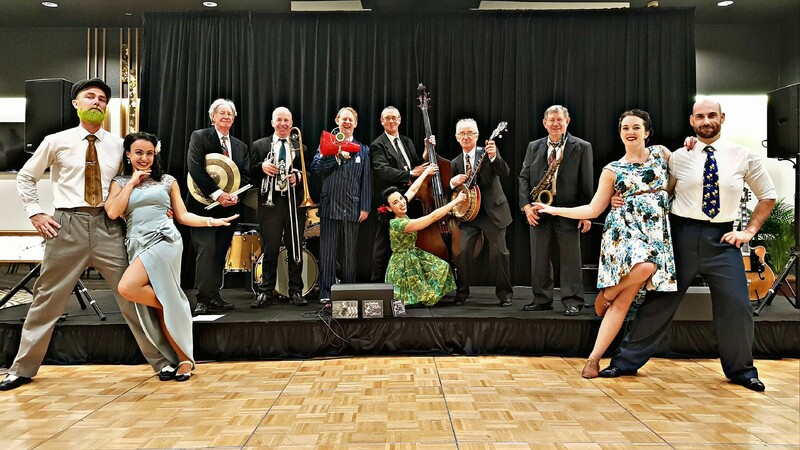 Authentic 1920s singer, world-toured guitar, banjo and sousaphone, excellent sound, and interesting people made this professional networking event spark. 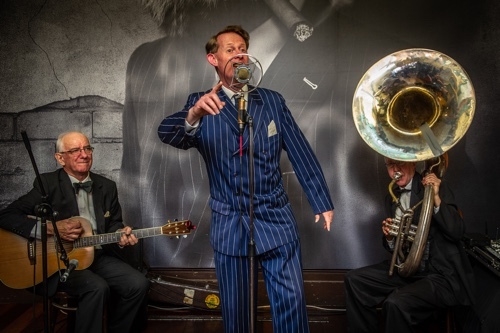 As members of the profession networked, Greg Poppleton, authentic 1920s singer accompanied by Grahame Conlon banjo and guitar, and Cazzbo Johns sousaphone, played their authentic 1920s repertoire with entertaining style and at background level. 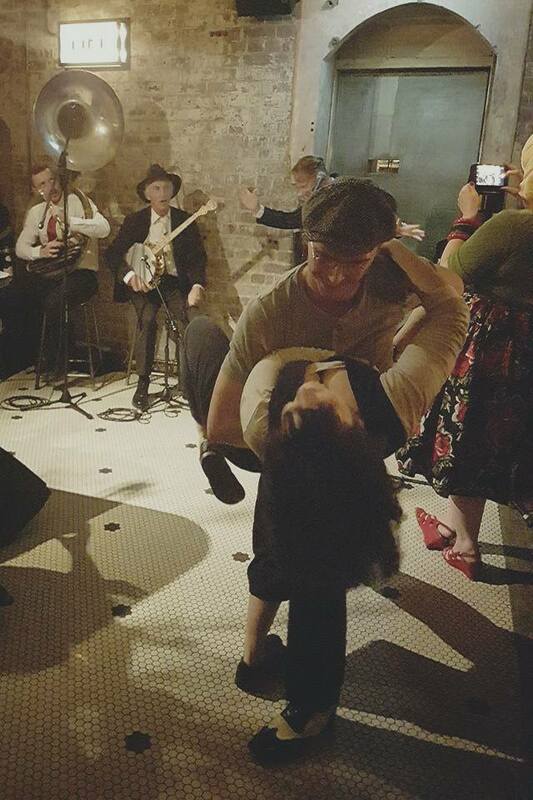 When guests wanted to dance, we happily obliged with The Charleston, a tango or a slow foxtrot. Sound was supplied with the band by OzManagement. Tony Jex, at OzManagement, is the band's booker. When you book Greg Poppleton, Tony can also supply you, at your request, sound, lights and staging in a one-stop shop A/V deal. And it guarantees you perfect sound and ambience every time. 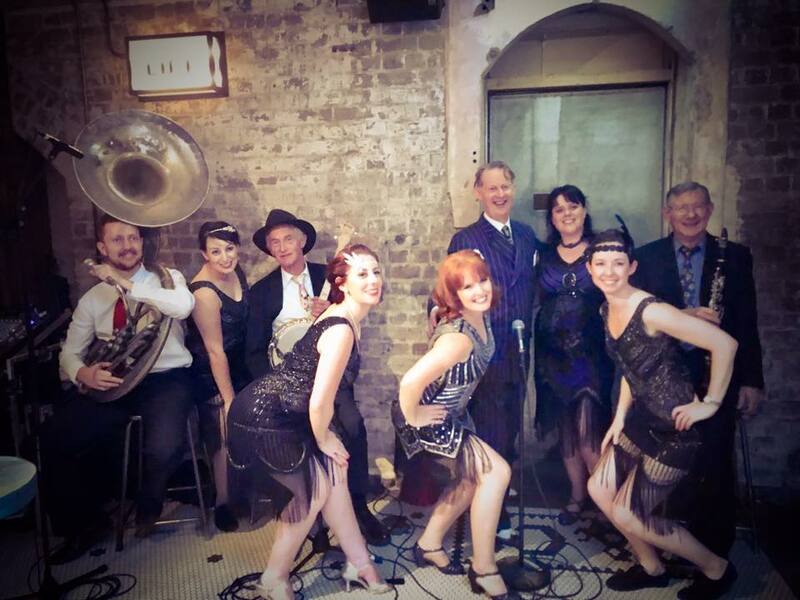 Have Australia's only authentic 1920s - 1930s singer Greg Poppleton and his band to Orchestra at your event. 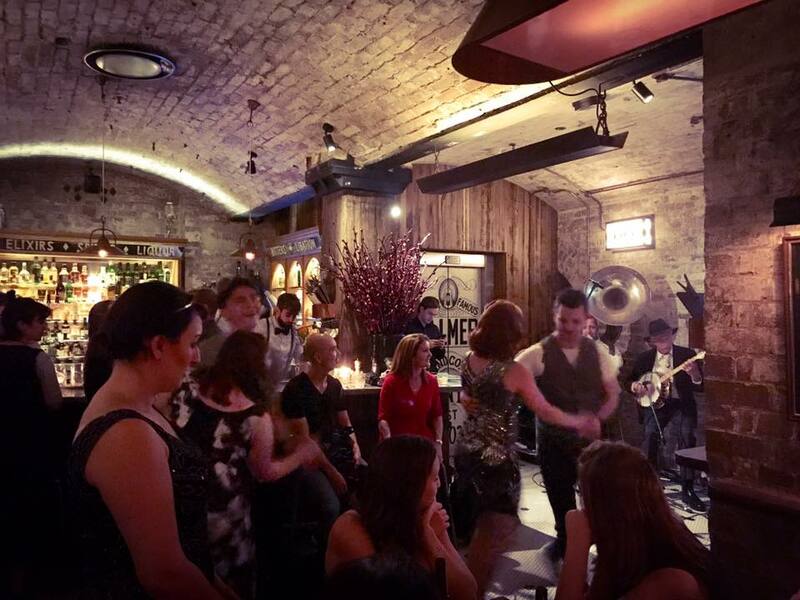 We can add swing dancers, dance lessons, sound, lights and staging. Tell us your requirements in the message section of the contact page. Thank you Aron Downie from Macquarie University for the photos and for permission to use them. Why is the focus on cows in this clip about bananas? That's a good question. Particularly since cows aren't mentioned in the song. I took the film you see in the clip while walking between the towns of Kiama and Gerringong in New South Wales. I saw this small herd sheltering from the hot sun under some small trees in the green, green grass. I perched my pocket camera on the thickest branch of a bush and filmed them. It was a little bit breezy, so the branch swayed, hence the unsteady clip. These cows look so contented! 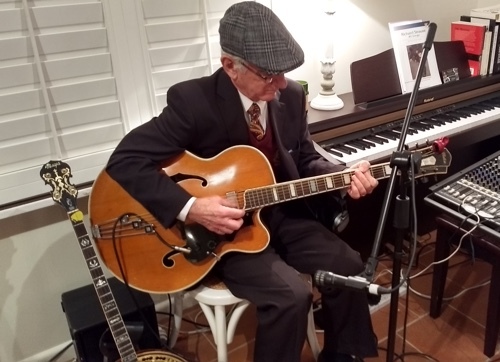 The Greg Poppleton 1920s-1930s Trio played for a speakeasy themed house party. We went down so well we were handsomely tipped at the end by the generous host. 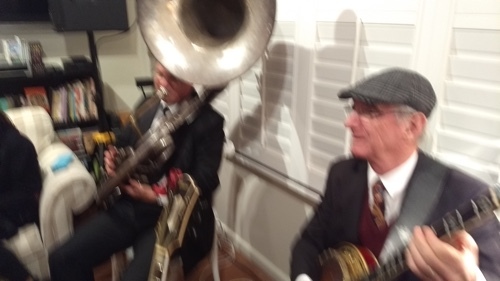 There was such an array of creative, talented, fun-loving people at the party who danced to Greg Poppleton 1920s-30s vocals with Grahame Conlon banjo and guitar and Geoff Power sousaphone and trumpet. We set up in a corner of the lounge room, loading in and setting up very carefully so as not to knock anything in the house. We used a small PA for the vocal mic and banjo. The guitar was played through a small amp. 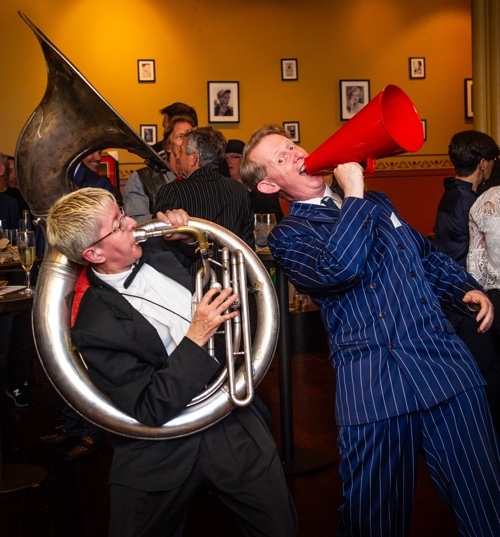 The trumpet and sousaphone did not need to be mic'd at all. And I supplied intermission music including 1930 radio broadcasts by the Philco Orchestra and 1933 Cocoanut Grove broadcasts by the Phil Harris Orchestra. The overall effect was a balanced 1920s-30s sound that was not loud. Guests could talk easily where the band played. Some were even sitting on couches right next to me as I sang. That's how the photo above was taken. And as always I sang personally to every guest who wanted to engage (which was everyone). No-one felt left out. I had a bad case of (non-contagious) laryngitis, so my singing was sounding somewhere between Tom Waits and Rochester from the 'Jack Benny Show'. I wish had recorded some of it. The show must go on! Some of the guests sang, too. 'Dark Eyes' and 'Mission to Moscow' were sung with much love by a duet of friends in Russian. An international opera tenor did a beautiful version of 'Autumn Leaves'. And a former back-up singer for punk bands joined me on 'Lili Marleen'. Initially the client wanted a big band. They'd already advertised the show as 'Swing Era', 'Glenn Miller', 'Big Band'. But a budget blow-out meant that the client needed a smaller band urgently - a band that could still create a big sound and a dynamic show through an energetic singer and front man. 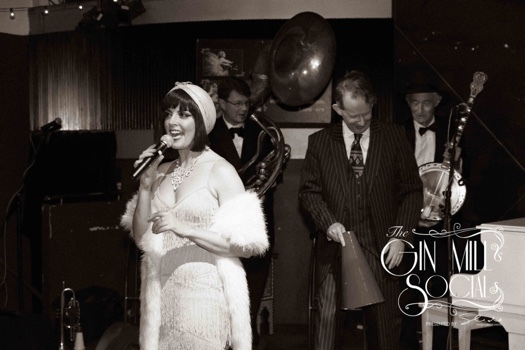 Call Australia's only authentic 1920s-30s singer - the client went for the six-piece Greg Poppleton jazz deco band. After that, no-one in the client group, or the audience, gave the 'Swing Era', 'Glenn Miller' Big Band a second thought. 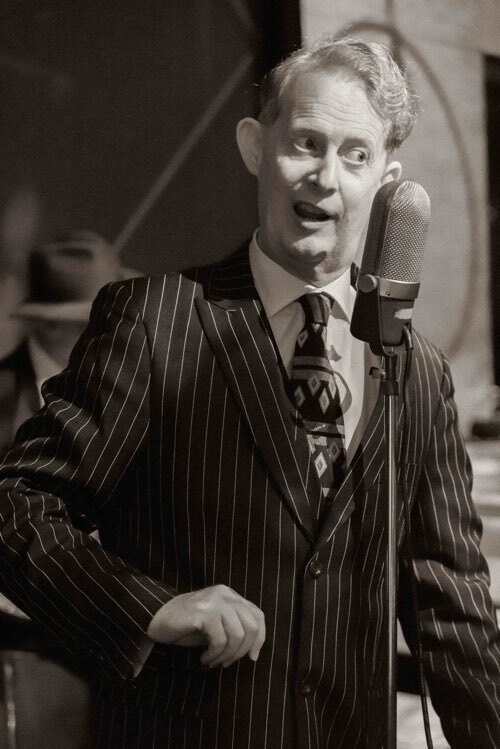 Greg Poppleton is Australia's only authentic 1920s-30s singer and band leader. The audience sang along and filmed and laughed and danced for a two hour show including lunch. The client said they would definitely book the band again. Because of the size of the room and the number of guests, 130, we provided our own digital sound system. We created a pleasant sound for the audience mixed by our engineer with ipad via a wireless connection. This is something we can do for audiences up to 5000 people. We filled the big band's shoes and more. Need an exciting band? How'd It Look and Sound? Presented by Slide at Cellos Grand Dining Room, Castlereagh Boutique Hotel on Saturday 16th September 2017. 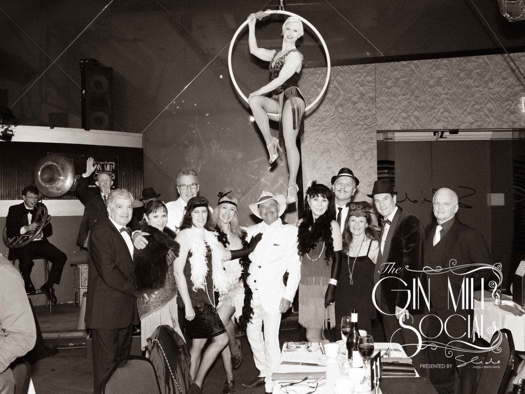 THE GIN MILL SOCIAL STRIKES AGAIN... A ROARING OLD TIME IT WAS! Hosted by Shanghai Sheba Williams. Produced by Jeremy 'Jersey' Brennan for Slide Sydney. Greg Poppleton and his 1920s trio at the Gin Mill Social: Greg Poppleton singer, Geoff Power sousaphone doubling trumpet and Paul Baker, banjo. Gin Mill MC - Sheba! Enjoy this perfect jazz set as you work online. Timed for the magic 53 minutes and 53 seconds. Hear Stereo Mix (free or download) at Bandcamp. Wednesday night, 26 April, Greg Poppleton and band returned to Palmer & Co to play at the Wednesday night 'Swinging At The Speakeasy'. One couple at the bar, enjoying Greg Poppleton and band, told me that our energetic, swinging, 1920s performance made them think they were back in New York City. With Greg Poppleton in the band were Paul Furniss clarinet, Paul Baker banjo and Greg Chilcott sousaphone. Sydney swing dance school, All About Swing, headed by Siobhan and Matthew, dress up for Swinging at the Speakeasy and dance to live bands. Free! 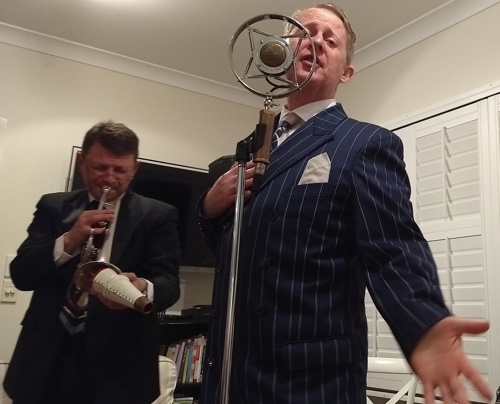 Authentic 1920s singer Greg Poppleton with his 1920s-30s duo to full 1920s orchestra is also available for all your entertainment needs. Request a quote now. 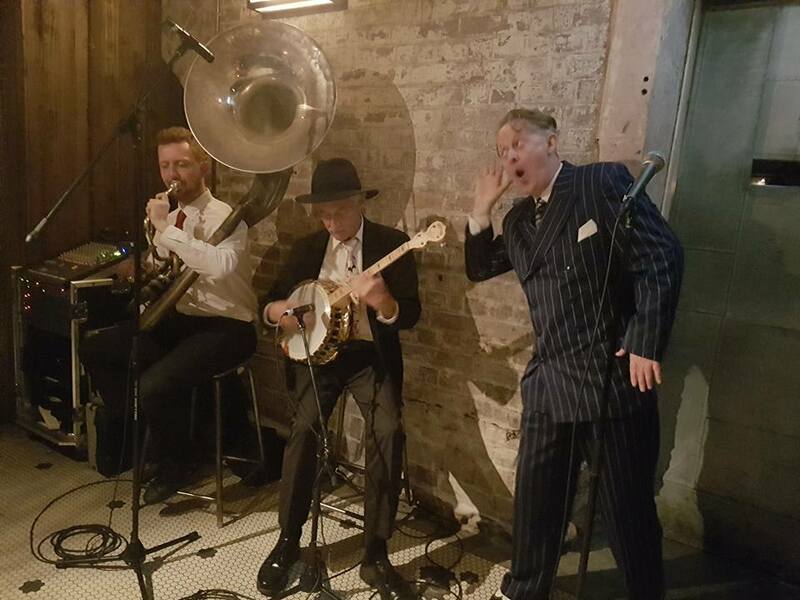 Greg Poppleton, authentic 1920s-30s singer and band (Paul Baker banjo, Greg Chilcott sousaphone, Paul Furniss clarinet (out of shot) Swinging At The Speakeasy. The vibe at Swinging At The Speakeasy as Greg Poppleton played. Would you like get the band's monthly newsletter so you know when we'll be back Swinging At The Speakeasy and at other places? Greg Poppleton Swingin' at the Speakeasy. Greg is singing the 1920s dance classic, The Charleston, to the All About Swing dancers. Wow! July’s Gin Mill Social was SOLD OUT weeks ahead. 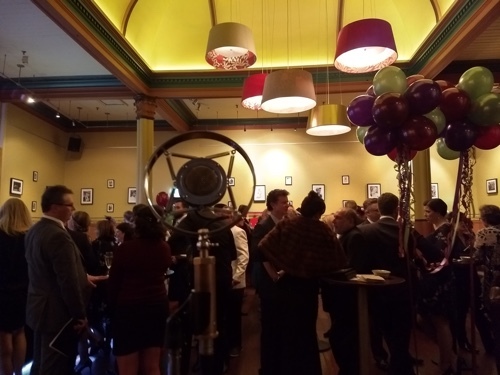 What a fun 1920s night it was in the beautiful Art Deco Cello Restaurant of the Castlereagh Boutique Hotel. The Greg Poppleton 1920s trio, Greg Poppleton (authentic 1920s vocals and megaphone) Geoff Power (sousaphone and cornet) and Paul Baker (banjo) serenaded guests in real Jazz Age style for the first 75 minutes. 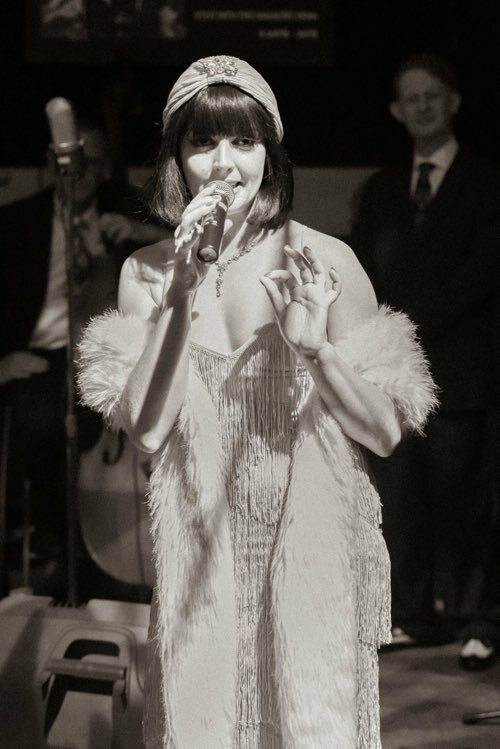 We add authentic 1920s-30s style and glamour to weddings, parties and corporate events - TAKE ACTION. Missy stunned with her globe poses and fan dance. Mr Gorski amazed with his fine balancing and juggling. The four course dinner was spectacular, as were the cocktails. MC Lou P Lou charmed the crowd. Of course, being Prohibition, there was a raid! The next Gin Mill Social is Saturday 16 September. Hurry and get your Tickets now before it sells out again. 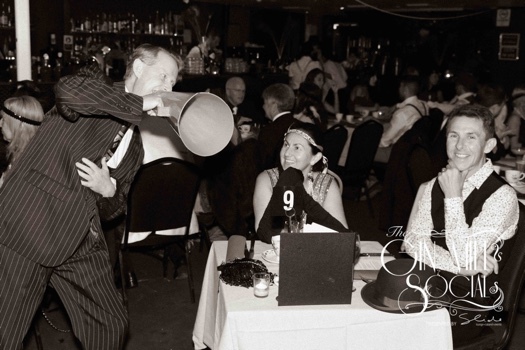 Book Greg Poppleton for your 1920s-30s theme wedding, party and corporate event. TAKE ACTION.